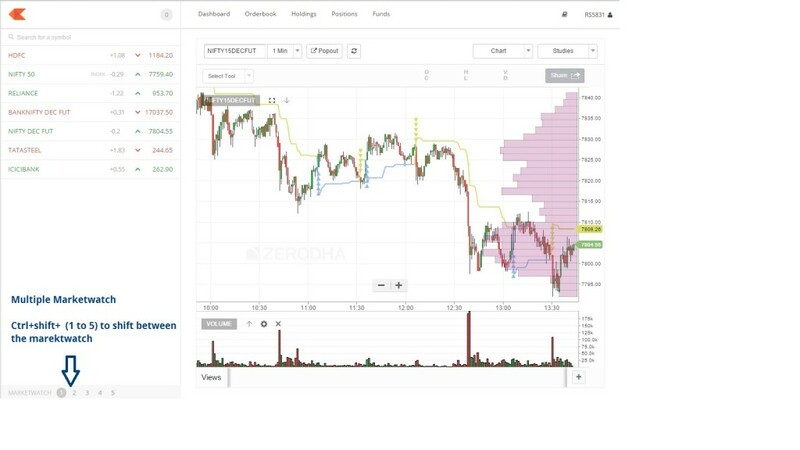 We at Zerodha are super excited about the rave reviews Kite(beta) our new web trading application has been getting for its super simple user interface, integrated trading and reporting (Q/Quant) platform, brilliant charting, intuitive search and filters, lightning fast trading, and more. Following is a quick tutorial on everything you need to know to get started on Kite. *market depth for illiquid scrips might take longer to load. *first trading platform in India to give you unlimited amount of intraday data. Keep dragging the chart to the left to load more. Popout for full screen & multiple charts. Set templates using views. Kite is enabled to all our clients by default, no need of sending any requests. Visit https://kite.zerodha.com/, and get started. We are working on our native mobile app (until then try kite.zerodha.com on your mobile browser, works well), and CO/BO order types. 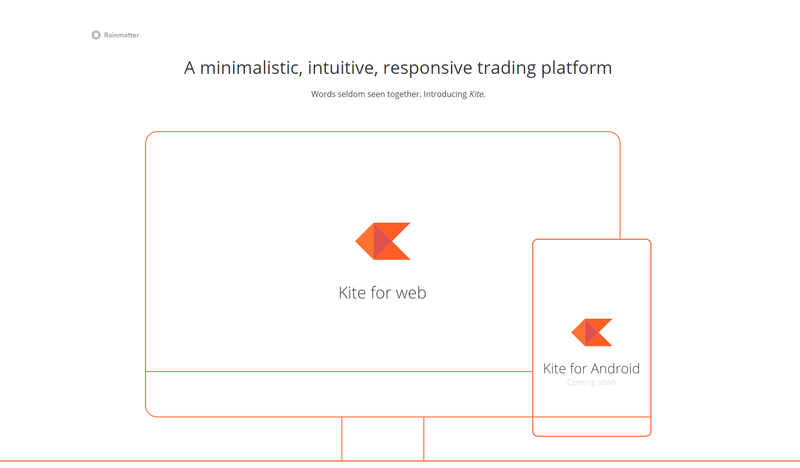 Hopefully all of you like the radically new trading experience on Kite. Sometimes the holding options shows ‘No holding’ whereas I am holding some stocks. Please look into this. BTW I have been addicted to kite. Very simple and elegant. When you are planning to launch mobile app of kite? Vikas, when the daily trade process is running (around 1 hour between 4pm to 7pm) or when we are running the eod/bod process on the server (between 12 midnight to 8am), it might not show up. Best to check q.zerodha.com at those times. We will probably give a link to Q directly from holdings, so it is easy for u to check. Kite is good platform and it has eased up lot of activity. One request can you please also a incorporate an order type which remains open till it is canceled or executed with validity in multiple of days. Its tricky considering the Exchanges cancel all pending orders at the end of the day. However we’re working on providing such a facility. You shall hear from us soon in this regards. I am eagerly waiting Valid Till Cancel order facility. Other brokers like IIFL and ICICI Direct have this facility. Can you please give the tentative date for this implementation. We’ll let you know once this feature is out. Wouldn’t be able to commit a tentative date. HDFC Securities have this feature of GTD good till date active for one one month and the program updates the order book every day when the order expires at end of day . If I cancel the pending order any time then the GTD also cancels. This is a very good feature for investors like us who are busy with life routines of work. I wish you can provide this feature also. Understand your concern, however this will take longer. We’ll let you know once it’s available. GTD is a must have feature. Kite and Zerodha is incomplete without it. Any ETA? Not yet, but hoping to be soon. I find that holding shown in “PI” as well as “KITE” are erroneous. It is scaring as you are not sure of your investments to be in the right hands. Please get the system updated to reflect the ‘Holdings’ accurately asap. I am really pissed off with this, I try to log in but it says gateway timed out. Unable to log in. The customer care number is not attended by the executives and yet my balance is deducted. Deepak, we were running maintenance activity today hence the gateway timed out issue. You can check now. Nithin – are these maintenance activities communicated to the clients in advance? I am new, so trying to understand the Zerodha process. Siva, every night between 1am to 5am we run end of day processes. So between these times, it is possible that the platform is down. I’ve recently started shifting to Zerodha. I’m very much satisfied with kite’s user friendliness. But the site seems to be down every day between 1 – 5 AM. Not much of inconvenience but I usually check this stuff when I come home after work late in the night. (kind of working in reverse circadian. We run end of day processes in the backend during which site is down. Its inevitable, but we’re trying to reduce the downtime. I have not seen or heard of any brokerage firm that causes so many problems for their users by giving wrong data in the name of backend processes. Most people login to check positions and P&L late night. Why the hell do you guys even need 4 hours EVERY SINGLE DAY during which the data is all screwed up ??!! I work for a large IT firm and my colleague runs large backend team. They are super shocked to even listen to this. Please check for yourself any and every other trading platform. No one does this !! I got so fed up that I opened another account. Soon you will find users leaving your services if you don’t fix this problem. May I ask why you limit the streaming quotes watchlist to 20 ? At least have another list where the updates happen say every 5 minutes if the reason is to reduce the load on your server. We currently use a vendor Thomson Reuters for our execution management system. Agreed they take 3 hours which is long for trade process, we are pushing them to reduce this. Btw, you can look at Q.zerodha.com at those times for all your reports. There are 5 watchlists you can have at one time each with 20 stocks. It is not to reduce load on server, but more because of the bandwidth constraints (due to the infra available in India) we have in streaming so much data. On the mobile, drawing tools not available. The idea with Kite is to keep it simple and not clutter it with too much information. You can use Pi if you need additional info while trading. Was looking for this question only if someone had raised it and bingo.. I found it. I am greatly satisfied with Pi and Kite. The problem is I cannot download Pi in my office desktop and I have to rely on Kite only. Percentages don’t give exact variation and also most of the traders talks in terms of change in points especially day traders. Percentages are good while working on weekly or monthly analysis.. but daily or intra day trades mostly focus on points variation. It would be great if you add this in Kite. I’ve raised this request to the developers. We’ll do our best. Did you get any success on implementing the change in points in the market watch. I see its there in the andriod app of Kite but not on HTML platform. Yup, it’s added on the app. I’ve told the Kite team, it’ll be out on the web soon. Do you have any update on this request. Did you get any update from your developer team on when the “change in points” will be added to Kite. I am eagerly waiting for it. I guess, its a fairly simple change to do. Nitin – Can you please let us know how to draw supply and demand zone in Kite? This will be a great help for scalpers and fast traders. I am not able to add BSE Stocks to Kite.zerodha.com and trade on the same.There are very good stocks in BSE. I am not sure why only NSE has been given access and not BSE.Can you please look into this issue and provide us the solution. BSE hopefully by this weekend. Thanks Nithin. I am eagerly waiting for BSE enablement on Kite interface. Please inform when its enabled. I am also eagerly waiting for BSE enablement on Kite. Beta will be given out next week. Hi Nithin, Great job by your team. Hope beta version of Kite mobile will be there for iPhone as well. Thanks. iOS will be launched subsequently. Android will be launched initially. Kite android app release date please ????? Can u send an email to [email protected] to get on the beta list . When is KITE android app coming? I am not able to see/add BSE stocks to trade on Kite. You promised the BSE will be enabled this week but not happened till now. Any reason for missing your target? or you changed the plan. We don’t have approvals for BSE Yet. You should be able to trade soon. The first one is an algo, so will be tough for us to offer. Second one, let me find out, we are planning to add a price ladder, that should help you out. Why? do we have any restriction by sebi that smart orders or alGo orders facility hould not be given OR provided to retail investors???? Same reason guns are not allowed to be bought easily :). If a person doesn’t know how to use, it can be damaging. I transferred fund to trading account but it is not shown in kite. At the same time it is showing in Q. Now, can I trade ? There was mock trading on exchanges yesterday, so I am guessing when you checked we were doing end of day process. Can you check now. I having serious issue with calculation of average price. Due to delay from ZERODHA customer support team, I losses some amount in MCX trading. The problem is very simple, Yesterday I took short position by selling 2 lot Aluminium in different timing, First lot for 115.80 and second lot for 114.90. On the same day(yesterday), I exit the 1st lot at 115.55 and carry over the 2nd lot for today, now I have 1 lot open position. How do you calculate my profit & Loss ? I asked this to your customer support team, the said as follows. 1) Calculate the average of 2 sell i.e 115.80 +114.90 = 230.7/2=115.35, So the average price is Rs. 115.35. 2) My P&L is difference between average price and exit buy price i.e 115.35-115.55 = -0.20(loss). But Still I have 1 open position, what is average price for currently having open position ? KITE shows that average price of currently having open position is Rs.114.9. But my argument is average price of 1 open position is RS.115.35. Regarding this issue I made email to customer support today morning(Ticket #452935) but as of now(9:32 PM, 04/Jan/2017) I did not get any proper answer. Due to this issue, even price was fall down below Rs, 115.35, I could not exit the open position to get some gain. I never before checked each price of details all my open position in KITE, but now suspect your KITE software. Apart from this issue, I really honest you and feel that this issue should come to your knowledge. We are living by getting small gains earned from market. I hope that you will understand my pain. Best wishes to your kind service. I believe an agent has spoken to you and has clarified the methodology used to compute average prices. I like your kite software also brokerage structure, I have one request to you is to add a single touch watch list of total futures and nifty 50 shares. I am guessing F&O is not enabled for you. Can you email [email protected] for this. Rajesh, yes trade.zerodha.com is a vendor based product and we are phasing it out. If Kite.zerodha.com is not opening up, I guess the admin in your office must be blocking it. Anyways getting someone to call you back and check this out. 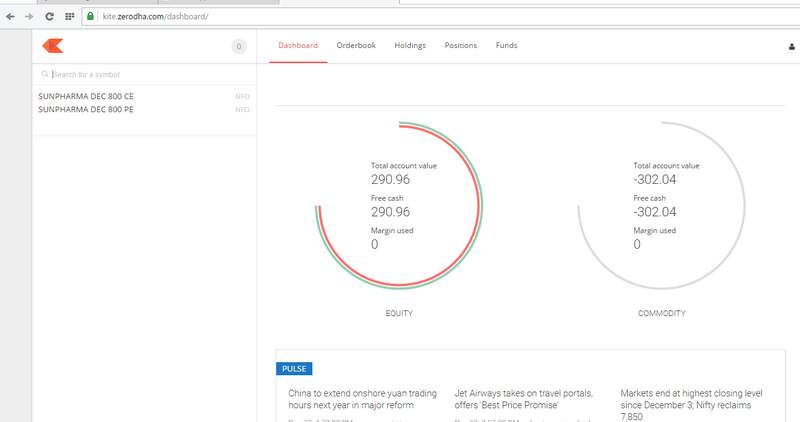 I found trade.zerodha extremely useful and practical. I am not able to use kite as it is not suiting to my trading style. I was surprised when today instead of trade.zerodha opening, only kite is opening. I would like to use trade.zerodha for my transactions. How can I do that? My guess is that you are clicking on trading login from our website. Visit https://trade.zerodha.com/ directly. https://trade.zerodha.com portal is still live. i have uninstalled my browser but the problem remained the same. is there any issue with kite?? There is no issue, are you having quickheal installed on your computer. Pi has been updated just now. What is new in this version? Chart data on the latest version is compressed much more than before. Opening charts will be a lot more faster, and will consume much lesser bandwidth. Additional shortcut keys, check this post. Also all the shortcut keys can be invoked directly from the charts directly. Day separator and pivot points can be separately used on charts now. Is there ATR Trailing stop in Pi chart? Not right now on PI. New indicators will take longer to come. Charts are not working on Pi….Its hang out for some time and finally giving me error as “Unable to connect to data server. ” since last week. How can I get this resolve ? Charts are not opening in Pi and therefore I can not use it fully. Error file is attached. is there co order in this kite? When can we expect Cover order in kite? Hmm.. we will check this out. Why BO for intraday only? Can we have same BO for normal trades. whatever order is pending (SL or target or both) cancelled EOD. I dont need extra leverage. But presently I have to type in 3 different orders. Also I am missing basket orders in PI. Balaji, exchanges haven’t yet approved BO for overnight trades. BO is kind of an algo(algorithm), so need exchange approvals to offer them. I have opened my account with Zeroda. It will be helpful if someone could walkthrough how to do the trading.I got my user id 3 days back and like to have a demo over the phone/. I am more interested using my mobile for trading.Will Kits opened in my mobile? Will get someone to call you back. Yes kite will work on your mobile browser. We will release the mobile app soon as well. It’ll take some time before the Windows version is released. We’ll keep you posted. I appreciate all the hard work of team zerodha for the beautiful platform and minimal brokerage cost. I would suggest to you to introduce some video tutorial on trading with kite or pi.Trader like me who are very new in trading and only doing equity trading due to lack of knowledge will be helpful if you provide some tutorial on different types of trading like options,Futures etc. When will be released Kite Mobile App because all people are waiting for that because kite mobile browser was not working sometimes. Stil we are waiting for Kite Andriod app can you tell when you are going to launch. Is the Kite Mobile App out? You can send an email to [email protected] asking for the beta access. Is Kite available as android app for mobile trading? Having browser based trading on mobile is not very convenient? Will be out in the next few weeks. hmm.. let me bounce this off our team. There are many platforms I have traded on in India and the US. Blown away by simplicity, intuitiveness of Kite. Loving the clutter free but yet the powerful trading experience. Can I use Kite on Ipad mini. I am unable to open both the above accounts at one time on Ipad. Can’t I open already existing watch lists (created in desktop version) with Kite. Can I work with NEST Trader on Apple Laptop. NEST doesn’t work on apple. Kite definitely does, both on apple laptop and ipad. The existing watchlist on NEST won’t be available on Kite, you will have to recreate it. If you want to login to two different accounts at same time on IPAD, either use different browsers or open the same browser in incognito. Add supertrend indicator in indicator section, and if possible drawing tools as u have in Pi on side toolbar would be much better in kite as well. I am regular trader on zerodha and I use NSE mobile app on iPhone. I want to know is any other zerodha app that works smoothly on iPhone? It will be better because the existing NSE app hangs sometime during trading time. Kite or Pi trading is available on iPhone? How to access them ?? please reply me on [email protected] or call 9819812821. Kite android is in beta. IOS might take time. Btw, have you tried kite.zerodha.com on your mobile browser? it works quite well. Sorry but ignore my earlier message as did not scroll down for mobile platform. I would like to know how soon or by when the KITE mobile app will be developed? especially for iPhone? I am fed up with NOW platform as it hangs a lot during placing orders and makes difficult to close the positions. Most of the time I lost money due to fluctuation in BNF and my orders are not executed on time. 2. Same login for web/mobile. 3. Trial not really possible. Hi Muni, we have over 100 indicators each on Kite and Pi. There are thousands of indicators out there, and it won’t be possible to offer each one. But yeah, adding your request to our list. scanners help a lot in spotting opportunities are there any pre built for KITE? if not where to find support for custom made requirements. Yes on our to do list. Have used your Kite Web Browser and It really superfast.The problem people like us who works in office can not continuously monitor screen in front of our colleagues , managers. It will be great if you launch Kite Android App soon. By when we can expect the Kite Android App Launch ? We’re looking at Early Jan beta release. Thank you for your kind reply. I am unable to add Bank nifty spot price in my dash board in Kite. Kindly guide me. Can you see the image above on how how to add index. Once you mention index in search box, all indices will show up, you can choose what to add. Unable to invoke shortcut keys (F1, F2 etc) directly from charts when they are popped out and active. Kindly suggest, how to do it? Yes currently not there, but we will soon give a buy/sell button on the chart itself. Is there any plan for kite iOS app? If so can you add bracket order feature too? With super trend pop up? IOS will take time. The android is being released now. A weird issue I am facing in pi. Whenever I am using cross hair or drawing any lines like trendline, etc. the candles are not formed i.e. the chart freezes. Only after releasing the mouse the new data is plotted on the charts. Yes Arun, that is how it works. Kite is a great product. Very intuitive, thoroughly enjoying it!!!! Good job. Could you guys have a view for option chain? (similar to the one NSE has, but real-time). Also, is there any plan to have a feed for news/events (like earnings, RBI meet etc…)? Its very hard to get a consolidated view of all these information. Yep option chain, and event/economic calendar on our list of things. But this will take sometime. is there any option to add multiple market watch tab in PI ? is it possible to provide price alert on kite.? will the price alerts expire by the end of the day in kite? The price alerts are available in NEST. But the limitation is the they expire by the end of the day. I have to again set them everyday in NEST. Will the price alerts be persistent till be they are triggered ( may be 10 or 30 days)? Yep, the price alert system we are working on will be valid for upto time period u choose. It has been more than 2.5 years now when you had confirmed that Kite platform would get alerting/scanner system in place. Please can you update on this. It would be great if the scanner/alert feature in Zerodha Kite platform could have ability to scan/alert as per the indicator strategy. On our list of things, but will take time. I liked the simple and smooth kite interface. I was not so comfortable with trade.zerodha.com. I had to use Z5 and it kept on losing connectivity after a few minutes. 1. When can we expect price alert to be added? 2. When can we expect Kite app for Android? Price alert is sometime away, android hopefully by month end. How can I put price alert on Kite? This is a great initiative and best for on the fly traders… I think its got every tool a trader wants… the only thing not working is saving the views on the charts.. i saved several times the indicators n everything as view but as soon as I log off it goes off .. can you please fix this? Kindly check Kite and Pi chart – for HeikinAshi Calculation. Couldn’t understand what formula is used. seems wrong at first instance as the Open price of the candle itself is wrong. As per investopedia the calculation of HA Open value is midpoint of the previous HA candle. this is wrong in HA Chart both in Kite and Pi. So kindly correct the calculation of open price of HA both in Pi and Kite. I can check the HA high and HA low only if the open value is correct. as the HA Open is a parameter of both HA high and HA low. Why you omitted 20min chart from Kite? Different people are comfortable with different time frames. so kindly include 20m time frame in Kite also in yet to release Mobile app. my humble request. Ability to choose custom time frame for chart will take a little longer. No trailing SL order support in Kite? Any plans to support it. Trailing Stop loss orders will save us from lots of tensions and time .Please enable it in KITE. Many working traders like me are unable to open Desktop application at office. Yep, working on getting both bracket and trailing SL live on kite. Nithin, Any expected date for Trailing SL support on Kite? Been waiting for Bracket order facility on KITE, endlessly..
You have managed to get almost everything right on the Kite platform, please included BO and CO on this and this platform will become invincible. please work on this. 3) I wish there be a trade done! sound alert (sound or popup at bottom right corner ) . 1. hmmm.. strange, works fine for me on chrome. Use the up down arrow to select a scrip on marketwatch and hit C, chart should open. 2. yes, on our list of things. 3. There is a sound alert and also the notification changes when a trade happens. 4. All functions have shortcut keys on Kite, so it is quit keyboard friendly. Use up and down arrow on the watchlist and keep hitting C to see different charts. Inside the charts, there are no shortcut keys, we are working on it. Great going…already started using from last month..
Great work on KITE. I am a beginner and this platform is much more accessible than NEST. I have 40000 in my account. I had transferred it in two steps first 10000 and then 30000. Kite shows my acc value as 9989 and free cash as 39989. Can I use the full 39k to buy ? Yes you can. My guess is that the 30,000 you transferred it today and hence showing separately. Your account balance will be showing 39989 tomm onwards. Do consider developing kite app for iOS as well,we are feeling left out :/ or Pi for Mac OS X.I do know that we can use virtual box or parallels to run Pi but nothing like a native app or software. Yep, Kite will have an IOS app as well. Is it possible to download eod data for pi? If not is Zerodha working with it? Also, for back testing, is it possible to add support n resistance levels in d formula for back testing along with indicators? You can open a day chart, export the data onto excel. Yes you can code support n resistance and backtest them. You can ask all coding queries on tradingqna.com, there are many answered already. I am grateful to you for zerodha..I am new and small trader. I go through your blogs and other important articles. They are very informative. I personally feel you are the best in your industry. 20 Rs trade charge is unique. I love your kite platform and really appreciate. Eagerly waiting for Android kite. Keep doing good work. We didn’t see the past history.we need to see day low,day high,previous close.And also we need selling price nd buying price also. There is a button as explained in the post above to see the marketdepth. You can see all the values there. Can i change the renko bar size? If yes, let me know how to change. Currently no option to change, when u change the time frame you will renko of a different bar size. Very soon we will give you an option to choose the size. Yes, we will soon have more data on that as well. Kite is absolutely super. Very light. Everything together. Charts and views are super helping. Option charts are big help. Absolutely loving it. Awaiting for mobile Apps. Only if you can provide to add few more scrips in ticker list it will be awesome. Or you may add features to add few group of tickers. We will soon give you an option to add multiple watchlist. During trade hours CASH Position is not updating properly in Kite? On Dash board it shows correctly but same is not reflecting while placing buy/sell MIS orders? Pl chk and correct it. Hmm.. seems to be working correctly. Can you send an email to [email protected] the next time this happens. and Pl activate CO on Kite at the earliest and make work with all the browsers. May you also add major international indexes to market watch like S&P500, Dow, Nikkie, Shanghai, Hangseng, FTSE100 ? Currently we don’t have data feed for international markets. We will probably add them in the future. Hi I could not able to open kite its showing invalid ID , hour to go ahead? Can you send an email to [email protected] with your client ID. We will have this checked. Is it possible to provide the Market depth option on the Chart popout? We are planning to give a buy/sell button with the LTP. Market depth, hmm.. let me find out from the team. Any update on this feature? Can we see market depth as bars on the chart? hmm.. no updates yet, we are working on fixing other bits of the back end. All I get is an Invalid Userid error message or an Internal Server Error error message. 1. I was pleasantly surprised by the call I received this morning from your support team to fix this issue. That shows your customer focus and a big thanks for that. 2. In the end, it happened to be a silly goof up where Kite does not recognize any old passwords with a special characters in it. This is not how you would build a new platform – the transition should be seamless and you cannot compromise on security when you move to a new platform. I am hoping this would be fixed soon. I had to change my password to use Kite. This could be happening only if your internet is dropping. Seems to be working fine for me even on my 4G phone connection. How to trade successfully in commodity by using kite ? That is weird. Working fine for us. If this happens the next time, can you send an email to us with a screenshot. Hi New Kite is really great. It is fast and lite. It is great to see the toturial today and i came to know about the popup charts and more we can see this it is really great. 1. When we see the Charts, admin positions and funds will not appear. And vice versa. we shuld be able to see chart candle movement along with our P/l on particular stock for Intra-day in two windows. 2. Also when we have multiple positions to watch for p/L chart for all should be seen ( Atleast 4/5 charts in on single scree). we are loosing time in toggling and taking decision – in Intra-day. 3. while watching positions, “>” appears at left. This gives same info. What is the importance not clear. 1. possible, on our list of things. 3. > is for position conversion. along with some more info on avg buy and avg sell. 4. Yes very soon we will have multiple watchlist. Not able to log in kite. Says invalid response from OMS. SAME HERE. UNABLE TO LOGIN. We run end of day process between 1am to 5am, so it is possible that that between these times u r not able to login. Looks pleasing to see the kite platform and eager to lay the hands on the Mobile trading app. How feasible is this feature? Your thoughts pls. If it is going to take long, do you know any software/portal which can currently do this for the NSE/BSE. Yes, strange that we were discussing on incorporating it just yesterday. Not just on live charts, but also a historical thing on Quant. You can go back in time and play the points where you have bought and sold. Kite is great ! But still has limitations. Why not add watchlists, like in “NSE PATASALA” ? By adding watch lists we can feel greater maneuverability in choosing scrips to trade.However it may be little more weighing in taking bandwidth it will be much convenience for traders, for both overnight and day traders! Hope you will look into the matter. We will have multiple watchlists soon. Kite is awesome. Simple, fast and easy to use. Charts are looking good as well. Kudos on delivering a great experience for the trader. 1 question (and not necessarily related to kite). say for Nifty futures trading, i have a cash margin to trade 1 contract and i am long 1 contract. i want to reverse the position if my SL is hit i.e. my SL sell order is entered for 2 contracts (1 to square off my original position and 1 to get me into reverse side). i find that i sometimes get “insufficient margin” message. i am guessing the margin calculation engine assumes i will have 2 contracts open whereas in reality it would be only 1 contract open as the other gets squared off. so the question is does the margin calculation engine take into account my existing position or just treats every order as a separate order? If you are holding one position, if you place an exit for that, no additional margin is required. But if you want to place an order over and above that first exit order, that will be treated as a fresh order and hence extra margin required. Currently not, but adding it to our to do list. How do I purchase mutual fund online through the portal? Nirav, currently not possible. This will be available in the next few weeks. why stock holding in pi dont refresh automatic . It does, can you make sure to update the latest instance of Pi. Click on “Check for updates” under help menu on Pi. Strange, can you send an email to [email protected] with your client ID. we will have this checked. 1) after initial login kite should show price chart of 1st scrip and not funds etc. 2) I wish to code my own indicator in kite ,,,how to do that? 1. hmm.. let me bounce it with the team. 2. Currently not possible, but we should be able to provide an option for this in the next few months. Just want to know if there is any update on Customized Indicator we can put on Kite.zerodha. I want to put my customized condition on Kite such that it shows BUY and SELL signals on KITE itself. any update on the same will be very helpful. We’re working on this, but I can’t give you a timeframe for when we’ll take it live. It difficult study chart because of chart open smaller area in screen. please provide new pop up for chart and tools better understanding. apart from that all are fine. I’m a day trader however unable to use Kite due to lack of Bracket Order functionality in it. Can you suggest by when Bracket order will be introduced in it. It will take a few more weeks. I used kite for last fifteen days that give nice experience but I can not found cover order buy/sell. Your Kite version is simple and superb, charts are also good, one request is, watching white background charts are difficult for eyes, can not watch is for long time, kindly add background color options in charts so we can set black or any other colors. any way, you have done fantastic work on kite version.. Excellent work and congrats for launching Kite. Pi was great but it was OS dependent. Have been waiting for this kind of application for a very long time.Now with Kite I can even trade in Ubuntu. Thank You very much and all the very best for the future of Zerodha. There should be option to add at least minimum 100 scrips or introduce watch list where one can create 5 watch list with 20 scrips in each…. Sam goes for Pi software.. biggest let down is no option to add watchlists…. Adding cash stock, future,option,commodity contracts to same list becomes unorganized…. Introduce heatmap where once can watch price action of 100 scrips together…. We will give you multiple watchlist soon. In Kite, keeping live index values in the corner would really help. I end of going to other website to find what is current index value. Kaivan, you can add index on the watchlist itself. Search for index in the search box, u will see all the indices. A friend of me is going to open a T&D a/c with Zerodha, but i have not refereed through the portal, instead i have asked him to put my client ID in the field in application . Is it enough or do i have to refer only through the portal. VJ, mandatory to put it on the portal. Can you have that done. Now it is not allowing me to do it, because my friend has already filled the form in online and entered my client ID in the referral field .But i had not done it through my back-office referral option . Send your friends detail to [email protected], we will do it from the backend. But from next time do use the referral page. It has been nothing but a pleasure using Pi. I switched over from Aditya Birla Money and the only item Zerodha is lacking is realtime portfolio tracking. This is a very valuable tool for customers that are day trading. With ABM website, it tracks previously purchased securities as well as new securities purchased today and gives you the current P&L. Kapil, if you can click on check for updates under help menu on Pi. The latest update give you live P&L of your holdings. also it would be nice if the watch list allowed more than 20 entries. Yes you can pay in funds using Kite. Yes we will give you option to add multiple watchlist. Great, but sorry, still unclear on how to transfer money in via kite. where is it placed..? Only funds withdraw option is clear i.e kite -> q backoffice -> fund withdraw…. no option to deposit funds. Go to funds –> Top hand right corner, Add funds button. You can click on it to add funds to your trading account. It will be really good to have a simple coded and powerful indicator “SuperTrend” in it. Please include it in studies. I would like to know if you guys can add a 2-mins timeframe candles for the chart. Could it be possible for you guys to include a 2 min charting into the small timeframe group? we are working on adding custom time frame. congrats,kite just bet hdfc secutities web rank. please update Bo&Co in kite. charts on kite are not fixed like PI.They go up and down some times out of the screen,please see to it. please show nse index on kite as shown in PI on right corner. ur remarkable hard work fascinate every Trader Sir I salute u for this great job,in a short time u made space in ur clients heart.Can v download Kite if no then how much time it will take 2 launch officially. Sir can u start Tips for ur clients just 1 in each segment Eq,FnO,Option,Commodity v will b very very grateful 2 u for such an act. Tips, don’t think we will be taking that route. When can we start placing mcx orders on kite. Am able to view charts but unable to place orders. And second thing I am your new client so j want to know that how can I payout my money? Same client ID and pwd that u r using on mobile. For paying out, visit q.zerodha.com and go to funds section. Great work with Kite.Just one suggestion,could we have more than 20 items on market watch and maybe multiple market watch as well. 1. Can we have index ticker on Kite (Ticker on top showing real time price changes), something like Pi. 2. Pi has an option to not provide transaction password while placing an order. Will it be possible to have the same in Kite? 1. We already have *all NSE* indices tickers which can be added to the marketwatch (and can be dragged to the top of the list). Just search for “index” in the marketwatch. Since the marketwatch is global and prevalent on all pages, it’s equivalent to having them stick somewhere. 2. Will pass on this feature requests to our developers. I m specifically talking about ticker shown in below pic. This helps a lot since even though all time PI page is not opened still ticker will be visible on any other page (chrome etc…). Do we have this feature in kite? If yes , please guide me how to activate it, if not can we have it? This is currently not possible on Kite. We will put it up as a feature request, but will take time. I can check the HA high and HA low only if the open value is correct, as the HA Open is a parameter of both HA high and HA low formula. Best wishes for all the Zerodha team and looking forward to see this feature ASAP. Had just few months of experience with other brokers before joining Zerodha and honestly it’s pathetic. Your 10 years patience in this field with the existing players is really commendable ! Recently I think you have added feature of Showing Total ‘Investments’ and Current Total ‘Value’ under Holdings Tab. I think it shows incorrect Total Investments. I may be wrong because some investments are still in T1 category. Is it like T1 category is not calculated under Investments ?? pls put some background colour to view the things clearly. It is little uncomfortable watching for long time. In Hollow Candle option I have observed bugs. Few of the candle still remain colored. Normal it need to be only bordered green or red not filled with color. Its quite useful option when we are trading and very easy on eyes. Please do the needful, Snapshot attached for your ready reference. Where is the Kite for Android.? how to add multiple stock watcher ? will appreciate an update on the same. BSE will take atleast 4 to 6 weeks more. I am not able to add BSE scrips on the kite watchlist. Is this still not possible ? Yeah, BSE still not on Kite. U will have to use trade.zerodha.com until it comes up. A new customer.Your platform is awesome. BSE is a real pain point. Please address this fast. Click on the funds button on the main nav, (next to holdings, positions), click on add funds. I’m a bit new to technical analysis so forgive me if my questions appear a bit amateurish. 1) Is there are option wherein we can display a moving averages ribbon with custom values (eg., a 5 value ribbon with values of 1 day, 5 days, 10 days, 50 days and 200 days)? 2) Can we place orders that extend beyond a single trading session? For example, can I set a sell order that would remain in place for several days until the target is met? 1. You will have to click on moving average, and add the 5 different moving averages individually. 2. Not possible. Exchanges in India remove all orders from the cache, hence has to be placed afresh everyday after close of trading every day. rainbow moving average is close to what you are seeking and is available in kite. time frames are fixed and cannot be altered. try it out i liked it. Pi is again showing new updated is available. what are the changes done? Change in Pi bridge for amibroker. Dear sir i am new trader i want to download your new trading platform software for trade with u more efficiently i.e. Pi from Zerodha official web page but i can’t. please suggest me how to trade zerodha Pi. Is this software or directly login to web page ? Pi is a desktop application (software). It has much more features then Kite web trading platform. After installing Pi, you need to login same like you do for online web trading and then perform trading. Sir My ID is DS7157 after i installed the Version 1.0.0.6 – released on 30/03/2015 of Pi on my Window 7 Laptop. when i login with my user id and password there is no response after that. and whenever i try to log in .. .. login ID or password is invalid is displaying.. Please give me a solution to log in the Pi software..
1. Cant we make the all values displayed as right aligned, it becomes hard to read some time. And if you can make it with two decimals consistent across will also help on the look and feel. When can we expect CO/BO from Kite. CO/BO will take a little longer. What about the Android native application? When can we expect? When accessing kite from mobile browser, we cant provide buy/sell price in decimal. There is no button to provide decimal (.). Not sure how did it pass QA testing. When am outside I can trade in decimal prices. Looks like this is your browser issue. Working fine on a bunch of mobiles i checked it on. Which phone/browser are u using? Am using default browser on my LG G3. Just tried in different browser on my mobile and it works fine. Please check if you can do something for default browser (testing on different browsers on mobile). would you have plans for dual login , watch charts in Kite & trade in Pi under one account . I am saying this since some of the indicators of Kite are awesome for viewing , while Pi is amazing for actual trade. Else There could be some sort of login like you have for back office , where you could login to Kite without the software allowing you to trade . Would loging into mobile disconnect the other login @ my PC ? Chandru, exchange compliance won’t let us allow you to login to two platforms with the same login at a time. Nithin, Is it possible to sort the list of stocks available in my watch list on Kite? 1. Renko bars seem to start from the latest price and work their way backwards – so everytime i open a renko chart, the brick extremities seem to be different. Wondering whether we could make this static. 2. 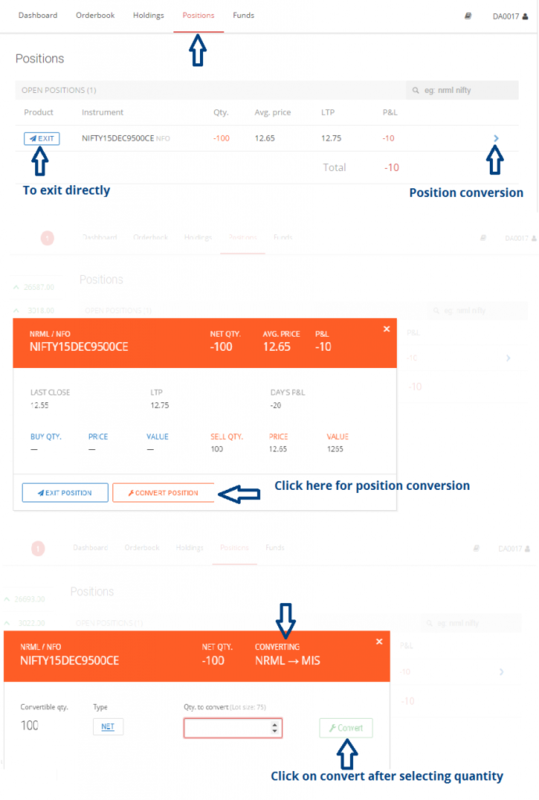 Positions page – it will be great to have a grouping feature for positions (say Nifty 8100 CE and NIFTY 8000 PE) – good for analysing option strategy profits. 3. Any thoughts on an advanced option strategy analyser and trade placement – like what you get with Dough in the US? Happy to get into more details over email / phone if this on the roadmap. 1. Yes, working on a few things around the Renko/Range bar charts. 2. Makes sense, putting it on our list of things to do. The declaration form to redeem the referral wallet or 60 day challenge doesn’t have a provision to mention the amount. Can you pls clarify? The entire money gets redeemed at the same time, you can’t choose the amount. whether kite and Pi both compatible to window 10 ? i have just installed pi in my pc. in pi chart data is very limited,while in mt4 there is large history of data.for ex.in pi nifty is from 2 jan 2015,while in mt4 is from 2008. so,is there any way that i can get past of any scrip especially from 2008. Yep, we are working on giving more data on Pi. 1. When we place order..in the entry screen give an option to check the best 5 bids and offer. 3. Also when i using kite from iphone by the order entry select market order and executes my trade…have notices at least 4 to 5 times. 1. This won’t be possible. 2. It is already there, check for the option callout and/or annotations. 3. Can you explain this a bit more. kite is super and excellent . but when will final version ready as beta version needs to be improved much in terms of data accuracy and missing data . this present state of kite in not in usable form . lot of defects . example : if you see tata motors ( or any other symbol) intraday chart , yesterday ( 7 th ) chart data missing in the whole chart . Kite has become very slow and now showing the market depth for all the instruments after it’s thrown open for many traders. I just hope the major release will have it more robust & resilient. *Not showing market depth for all the instruments. Market depth shouldn’t become slow, my guess is that u were trying to open market depth of an illiquid stock. If there are no ticks on the stock, market depth takes time to open. But yes, the platform was slow in terms of moving around and placing orders. We are working on it. I am new to Zerodha and main reason I selected Zerodha is because of BO/CO which is nicely explained in your blog. But BO/CO features are not available through kite and only available in PI which I am not able to use from my office due to network security. How about IPhone app , any tentative timeline ? We would like to request you to expedite Kite BO/CO rollout. Ash, we should have this up in the next 2 to 3 weeks. Android app will come out first followed by Iphone. Android is atleast 4 weeks away. Kite BO/CO will it be available with limit buy feature. Kite is no doubt great tool, very light and fast but need to be loaded with essential features. BO will come with limit, CO is still market. Will take some more time for this. Just want to clarify here when I said “limit buy”, I meant to trigger buy/sell order only if price breaks above / below the limit or trigger price. Currently if we put limit price higher than market price , order is getting executed at market price. Are you planning to add buy above or sell below trigger price in Kite BO or PI BO in near future ? Ash, if you want to set buy triggers, you need to use Stoploss orders for that to enter. So if you want to buy at 101 and current price is 100. Place SL-M buy order with trigger price 101. This feature is currently not available for CO/BO. Will take some time. you have answered this earlier that CO is not available on Kite yet and planned soon. Any approximate timeline you have in mind or plan? What i like about kite is its amazing simplicity and performance. works on mobile browser and laptops in equal efficiency. Is there some way to have the kite chart running on one terminal when you sign on to another? because as of now, when you sign on to another terminal while logged on either mobile or other device/laptop, the earlier session gets terminated. The reason I am asking this is because, it helps especially when using Zerodha nest trader on one side and use the charts from kite as they are really good and simple. I am also eagerly waiting for the CO feature in KITE. I have tried this, if you first open “Kite” keep it open, and then log in to Nest Trader both will be available, but if you do the vice versa either of them will be disabled. It was a little slow towards the end of day today, we will have it fixed over the weekend. Is it possible to include the index values dialogue box in kite? Or atleast nifty spot price. Yes, no separate dialogue box, but you can add index on marketwatch, check the second image in the post above. Sir, Please provide data at least 5 to 10 years data for all BSE, NSE, F&O, etc. You said that you provide 5 years data but it is totally wrong. Please make PI more user friendly, add line chart.,ADX,super trend, ATR etc. Zoom function need to improve. Check this chart. WE have 5 years + of daily data for top 200 stocks. We will add much more soon. What is the source of data for charts? Is it reliable one like from NSE, BSE? Source of data is our trading servers, so yeah quite reliable. If you are comparing to other charts, make sure to check this. Kite chart is showing data for 10th Oct – Saturday !!! Ashish, there was mocktrading on the exchange yesterday. It was removed after the close of mock session. I have script DIAPOWER in market watch in kite. It is showing Infinite as the percentage change . Please check from your side. If possible rectify. Date format for charts in kite is mm-dd-yyyy. Is it possible to change that to indian format i.e., dd-mm-yyyy ? Please provide limit order for CO/BO..? BO already has limit order feature. I HAVE OPEN CHARTS ON KITE AND I WANT TO ADD STUDY (KNOW SURE THING) . BUT THERE IS NO OPTION OF THIS. Of course there is option to add study as explained in the post above. If you are not seeing, my guess is that you are probably using a very old browser, try getting the latest version of google chrome or firefox. What is kite? And does it work real time in mobile? Pl explain. I trade in option stocks daily. Pl tell whther will it be comfortable trading option stocks from kite in mobile. Pulkit, kite is a very slick webapp that works very well on mobile as well. Kite mobile will also be available soon. Yes the current version of our mobile app is a vendor based product (Thomson Reuters) and not that great. I am trying to add Bank Nifty spot price into the watchlist…but not able to do. All i see are Bank Nifty futures & Option data if i type in “Bank Nifty” in the search option. Raghavendra, type index in the search box. You will see the entire list of indices, look at the post above. Thanks a lot Nitin, now i am able to add Bank Nifty index. I have been using Kite for past 2 months now and often i see issues while placing /changing / refreshing my orders and current positions. For the same reason, i log into Z5 in parallel and trade it from there. Some of the issues for which i don’t have a snapshot , will try to take and provide it in future. 1. For orders placed and present in order book – I could not cancel it today. 2. 4 weeks back, I was intending to square off my position. Order says complete but when i refresh the orders continue to show as “open orders”. Lost money due to that. 3. Occasionally, When i refresh my “positions”, i see trades / positions which i haven’t traded / initiated. Not sure if these above are experienced by other members who are using Kite, but i am NOT 100% sure to use KITE alone. I use Z5 in parallel to confirm ( almost all the time ) to see that my orders are executed. Will try to provide evidence if i see similar errors / issues OR new ones in future. Raghavendra, most of these issues have been sorted, can you email me on [email protected] and keep [email protected] in cc, the next time you spot anything. Thanks a lot Mr.Nitin … its very useful modified Kite , Position conversion , chart and placing order is unique in this app. My question is any attachment with ” Amibroker ” in new Kite ? 1. Place BO/CO in Kite? 2. Draw Trendlines in Kite (IN MY MOBILE BROWSER)? 2. On mobile browser is probably little tricky. you will have to use drawing tools. Why we are unable to add multiple market watches in Pi ? Is Kite accessible to NSE-NOW users? Just wanted to check as I read the statement- “Kite is enabled to all our clients by default, no need of sending any requests”. we get any tips from you for trading and investment? hi I am a new user, I am able to login to trade.zerodha.com through my username and password but not on kite.zerodha.com is it not open to new members(DA6686)? And free from punching daily same thing. You have told that in few days it will come but didn’t in latest update. Can plz tell much more it will take? Kislay, can’t share a timeline for this. But we are working on this along with a bunch of other things. I could not find few symbols(eg. zenotech) in kite platform which can be seen in trade platform, hope you are working on it and all the symbols would be available, Rest is awesome…!! Thanks Bipin. Zenotech is a BSE stock, currently only NSE is possible on Kite. Firstly i want to say, you are doing great job. Why cant you give all option & facilities in one login. Example: now, kite, pi, backoffice, trade, everything is separate. Please try to do in one login. Yogesh, within Kite you can access the backoffice (Q). Now is a separate trading platform altogether which is maintained by NSE. We are working on making everything work within Kite for the web and within Pi for desktop. 1.i update to pi latest version but stock holding is not auto updating it has refresh button which i have to click every time to see latest stock value and p&l . 2. I read ilfs dp amc are to be pay by client not by zerodha .. but this year dp amc charges are debited from my trading account . I am not able to place an order on Kite.zerodha any time. have already reported this to the support team but to no avail. Really disappointing that, no one is addressing the issue even after multiple complaints. Issue: when ever I enter transaction password for placing order, I get this error on screen. Happening from almost a month. Till now I was not able to place a single order in KITE. I am doing no mistake, as I was able to place the same order from Z5 with out any issues at the same time with same transaction password. Kite is really good to access from mobile/desktop but its of no use , as I am unable to place orders as of now. I will be waiting with some hope atleast now to get some positive response. Prathi, are you using any special characters in your transaction password. Can you change the password to one without it and try. thanks Nithin. It worked fine. But I am a bit disappointed here, as your team is not able to resolve this simple case , and keep on repeating that there is no issue at their end even though I failed multiple times from Kite. They simply keep giving lame solutions like, check your internet, enter correct website and what not !! Even though I say I failed at transaction screen, they will ask again were you able to login !!!!!!!!!!!!! I know there will be different kind of issues, but I assume you have to train your support team a bit further for understanding what end user says. Hello Nithin: I was trying kite today and a question arose which had troubled me a few months ago. You see your software Kite or Pi they work fine when installed alone on a PC but when some other brokers software ODIN is also installed then the charts for any scrip show an error for the software installed second. The first one works ok. I had placed a request with your support section some time ago but they couldnt sort it out. You think you could help or it is a technical gap that just exists and cannot be sorted out presently.Thanks. We will check this out. We have tried it along with NEST and works well. We will try it along with ODIN also and check. 1) The streaming data to Kite stops very frequently which is very annoying . i tested this with my office network, home network (cable) and also data cards. the problem is same . There is no refresh for the left pane and even the refresh in Charts doesnt work . it will start again after some time . My freind also have the same issue. I use firefox . Do you recommend any specific browser ? 2) How to change the box size and reversal for a PF chart in Kite ? 1. Today we had some issue in the morning, can you email [email protected] the next time it happens. We can investigate. 2. Currently not possible, just the default available. We will give you an option soon. sure . its not a single day issue. It s recurring. Will contact the mentioned email id tomorrow. Hi, I could neither find VWAP on Pi or Kite? Are you having any plans to make it available? Thanks. We are still working on all the backend bit for Pi and Kite. Once done, we will work on adding new indicators. Thank you for the two wonderful platform for traders. I do have some requirements. Please make renko box editable in KITE like PI, and also make volumes present in KITE for Renko charts. This is very important for Renko chart traders. Because in PI, the moving averages are not smooth when drawn over renko charts. 1. EMA, SMA, Stochastics yields different formation compared to the same setup in KITE. 2. “Trade on charts” also not possible on Renko charts. 4. OHLC values not displayed when using Crosshair on Renko charts on PI. Kindly fix either one of below needs on urgent basis. Would be really helpful to trade. 1. Making Renko box editable in KITE. Please see the differences in attached images. The 2-step secure login (Security questions), probably you can make this optional where the user can turn it off! We really find it little annoying at least when we access from mobile! Please do give it a thought as there is anyway a transaction password for orders. Unfortunately this is an exchange requirement. Best to keep answer as a single character. Hi Team, The kite is rocking !!! I am enjoying it. I have a doubt on the “Exit” buttons. What happens when I press it ? Does it makes a square off market order or it takes me to a form where I can enter the details for the square off. Thanks !! all the best team. Thanks, it opens another form where you can enter details. I am trying to load nifty oct options in Kite but none of the oct options can been found in the drop down list. strangely Nifty jun options is thrown upon us even when type in the full symbol code. See the screen shot. Also I tried to use your zerodha mobile app on my ipad. It does not work properly. Every now and then the pop up screen in which details of symbol etc is required to be filled in to be able to add it to the market watch, one or other menu does not respond at all making it impossible to add any symbol to market watch. As well the price was not updating dynamically according to the market. The Nifty Oct fut shows static price as when it was added to the market watch, therafter, it does not change at all. This was just the beginning experience for me with your app. Please ensure smoother functionality and respond. Those are long dated options on Nifty (Jun 2020). After entering Nifty in the search box mention either oct followed by CE or PE, you will see all october options. Let me get someone to call you and check the other things u spotted, shouldn’t happen. I am an marketing Executive and have some question . 1) I buy a stock today in CNC and take the delivery of it . Can i also place a stop loss valid till cancellation ? 2)A stock is in my demat and i place a sell order at a certain price valid till cancellation ? Please let me know if their is functionality in Zerodha . I moved to Zerodha from ICICI but ICICI had this function and it was soooo useful for someone who can not track their portfolio daily . Going by my portfolio performance i seriously think of going back to ICICI where i could have put a stop loss to protect the portfolio from big loss . shall Login in both Pi &Kite? Yes you can, but not at the same time. is Bracket order and trailing stop loss feature there in kite ? Kite web version is simply awesome. Slick and effortless, Charting is superb. Pls roll-out the android app asap. On the login side, can you take all four inputs on same screen ?! All 4 inputs on same screen is currently not possible. Thanks. I’m loving trading in kite. But now I started trading bracket order. So I’m using pi software. When can we expect bracket order feature in kite? I’m looking forward for it too. Plz roll it out asap. Nice initiative to make things simpler by Kite. Currently the Holding tab in Kite does not sum up the T1 holdings for Investments and Value as done in q.zerodha. In fact the q.zerodha have soem extra columns like buy value , current value and weightage which are very useful . It will be better if we have the same columns in both the places. The idea is to keep Kite as light as possible to give you a better experience. We don’t want to complicate things by having too much data. Having said that you can directly login to Q from Kite without having to enter your Q credentials. You could always refer to the holdings page in Q.
I am facing a problem. On kite dashboard, it show EQUITY – NOT ENABLED. Please help. Whenever I try to BUY it says ‘Product code not valid’. My guess is that your demat account is not yet mapped. Can you send an email to [email protected] with your client ID. I am a swing positional trader and i like to trade longer timeframes but less data for longer time frames like daily weekly monthly on both pi and kite.Any solution? We will start adding more data soon. Tick data is essential for creation of Renko charts and range bars.But ,Kite is providing quote of one minute time frame. Can you provide tick data through kite? Can you provide tick data of one one day for back fill purpose? looking forward for price profile too and merged profile too AND DOM. Shambhu, the issues of last couple of days has been fixed. Can you check it now/monday and let us know. What are those pink color bars in price chart of stocks screenshots in your post? Volume profile charts, check this. That’s an awesome indicator, especially for intraday. Thanks Nithin. Ideally the ILFS demat should open in 7 to 10 working days. So monday/tuesday it should be. Will get someone to check. If you are trying on a day when market is closed, it won’t show up as there will be no data on the exchanges. Can you please advise by when Bracket Order feature will be available on Kite? We’ll let you know. Right now its under development. Hi…In Pi, currently, there is no option to change the scrip directly from within the chart window itself. Everytime I have to open a chart for a different scrip from market watch window. This is very tedious & cumbersome. This also doesn’t allow the idea of having a chart template which defeats the purpose for technical analysts like me who are completely dependent on charts for trading. By when can we see this feature integrated in Pi? This is on cards. Should likely be done in the next version release of Pi. Currently under development. We’ll let you know once its released. Was there a data issue today in kite? TATASTEEL Data was present til 23/10 and then today’s candles started forming. It was correct in pi though. the kite charts are not loading since today evening. it was working in morning. could you please get this checked. We did run into a couple of issues which got sorted out last evening. Don’t see any attachments here. Could you specify which contract? I’m able to see daily chart for 26th for Nifty Futures. I have been using Kite for the past one week. It is very good in many respects. However I would like to have two simple facilities. B) display the p&L on the chart itself with a “Exit” button. This will help us take a quick action based on the actual trend. Presently, I have to shuttel back & forth between the chart and positions page. If the “Exit” and P&L is displayed on the chart itself, it would be much elegant and more trader friendly. You can add these right after the “Select” drop down box. Pls try to implement these as soon as possible. I am sure most of the traders would welcome this facility. A) We already have *all NSE* index tickers which can be added to the marketwatch (and can be dragged to the top of the list). Just search for “index” in the marketwatch. Since the marketwatch is global and prevalent on all pages, it’s equivalent to having them stick somewhere. B) Displaying the P&L on the chart is quiet tricky and will take some doing. Imagine a scenario where you are already holding some stocks and buy the same stocks for Intraday. Which P&L should show up on the chart? The Intraday one or the one that you’ve been holding. It seems quiet complex. Nonetheless, I’ll pass on the feedback to our developers. Since I didn’t exit yesterday, it showed in the “Holdings” today. I exited the holding today now. However it started showing in the “Positions” page as short sell position. Actually, I only exited the position I was holding yesterday, which means I do not hold any bought / sold positions. It should not show in the “Positions” page. Just imagine, what would happen if I press “Exit” button on the positions page ? The position page would show you your day position only which is why it would shows as short sell. If you pressed Exit, it would buy back and the trade would be considered as an Intraday trade. This is exactly what I am talking about. I exited the position that was holding since yesterday. That means I do not have any holdings. It should not show in the position page as sold position. If I had pressed the exit button on that positions page, It would have created a new position, that was not intended. I hope you understood the issue. I love this Kite platform. I was always looking around for candle stick chart option through web browser and you have given the exact tool i needed. Signed up for ZERODHA few days back and i am very happy with this shift to new broker. I am looking forward for candle stick charting option in android platform. Can you please let me know if you are planning to roll out android app with charting option. Yes, the android app is currently under development. We’ll let you know once its out. It would be very useful if there was a page where i could see the latest quarterly earnings results (news articles) of all the stocks that i own all in one place. Additionally i don’t know if you got a chance to run this by your tech team but a checkbox next to the stocks would be helpful ( In Q ). This enables me to see the total of only the stocks that i want to . Kite is a web interface. There will be no exe released. It will work on Internet connections which are stable. Min requirement = 512kbps. I received an email that my account has been created today with Zerodha. I am able to login to trade.zerodha.com , but I am not able to login to Kite.zerodha.com, any specific reason? Also, is there a toll free number for your customer care, I guess if it is not there, you should get one as it would help us a lot. Thanks. We’ve enabled Kite. Can you check now? Last time I checked, you had mentioned that Kite would be having CO (I’m not even talking about BO 🙂 ) soon. When can we finally get this? Our developers are working hard to bring this feature on Kite 🙂 We’ll keep you posted on when its available. Raised ticket to resolve the password issue while log in. They resolved the password by changing of my password without my prior consent/knowledge. Strange!!!! and still reset password not working. Issue: If you place an AMO order with Kite there is no way to cancel it. Atleast thats my experience and thats what support team informed me. So probably AMO orders should still be done via older tools. What is expected time for Kite Mobile app? Facing difficulties with the size the links in mobile browser. Typing transaction password is really a pain using mobile browser. Please fix it. By when it will be possible for you to launch Bracket Order feature in Kite-web. It will take a little longer, can’t give a timeline yet. For the last couple of days have been observing data missing for the cash scripts from Kite charts. During market hours typically data for the previous trading day is not there. Today during trading hours, data for 02/11 was not there. Now when logged in to Kite at 1830 hrs, data for 02/11 is there but data for 03/11 has gone missing. The whole point of using the chart in Kite gets defeated. Pl have this corrected on an immediate basis. Few brainstorming thoughts / wishlist from my side on your up coming Kite mobile App. 1) UI should be very light and should be loaded in lghtning speed. 3) once logged in should not logout….or able to set the logout time on the settings. 5) Able to configure and see Mutiple watch list. 6) Able to set script notification alert on phone itself for EQ/NFO scripts in watch list (based on Price value or by price points or by chnage in %) this feature not available in any of the latest market apps, it would be innovative if you implement this on kite app. also this feature is a crucial for persons like me who is away from the terminal but wanted to know the price meovement. 7) Able to set notification alert on phone for portfolio/m2m open positions for EQ/NFO scripts (based on Price value or by price points or by chnage in %) again this would be unique one for zerodha if implemented and useful for persons like me to squareoff the open positions if my M2M value reaches a particular value. 8) able to see live LTP and atleast 2 bids/ask qty & price on the buy/sell order window, this is again a very cruical feature for persons like me who want to punch the order fast without any guessing. 9) charting, simple candle chart with time frames 1min 5min and 15min would be more than suffiient enough. Hope you would consider and feedback to your technical team implementing the App. We’ll pass on the feedback to our developers. Its been around 4 months kite has released,but no cover order yet.some indicators are not there on PI shown only in kite.so i should trade only in kite. We’re dependent on the Exchanges to provide certain approvals. We are in the process of getting it done. shall get PCR trend and oI in kite? I am trading only in US ETF’s of S & P and Gold. Will you provide US ETF trading ? Like I see S & P futures are available to trade using Zerodha, but not ETF’s. We allow trading on all instruments that get traded on NSE, BSE, MCX-SX and MCX. I don’t think S&P ETF’s are trading on any Exchange in India. Gold ETF’s are available for trading – Symbol – Goldbees. When can we have Investment in MF possible through Kite ?? Also awaiting updated response on availablity of CO in kite! MF very soon, CO/BO on kite is something that will take little longer. I am using kite charts and I love it. However, I have one suggestion/request for change….For example-If I open a chart for SBI and then change it to ONGC from the search box the tab title in the browser tab doesn’t change to ONGC…it keeps showing SBI. Deepak, seems to be working fine for me. Seems like a browser issue, which browser are u using? Sorry for the repost. I couldn’t find the first one….Anyways. I tried it on Safari/Chrome/Firefox on my Macbook but it’s not working. Let me get someone to check this on a macbook. I am using kite charts and I love it. However, I have one suggestion/request for change….If I open a chart of SBI and then change it to ONGC from the search box the tab title in the browser tab doesn’t change to ONGC. Can this be changed? It will be helpful to find the right chart when multiple tabs are open in the browser window. can i have any other solution for that ? please correct the issue soon. Not able to login to q (back office) directly but I can get to this through KIte. please clarify why? The password to login into Q directly is a separate one which you would have received in the welcome letter. You can set ur own password by using forgot password link. Only 20 scrips can be viewed. Need some more market watch screens to add more scrips. Greetings for Dhanteras and Diwali ! One concern, Pivot points shown in charts in Kite is different than that of Pi. Yes, Pivot points uses a slightly different calculation on Kite. 1. Please add Camarilla pivots in Kite as everyone had asked earlier. 2. I feel PI pivot points (Support and resistance) are more accurate than Kite, Can we have Pi Pivot as well may be as standard Pivot 2. 3. Also like we pop out charts in next tab can we have pop out market watch (Extended Market watch), which can have PI like view, for market watch? I just noticed in Kite that your Studies has ” Aligator ” & ” Gator ” as indicators which are one and the same. Since i use them i accidentally noticed the similarity. I want to use Kite on my mobile browser, but when I use my login details, it tells me “login ID or password is invalid.” I’m using the same details that I use to login on my laptop. Not sure what the problem is. Weird, can you send an email to [email protected] with ur client ID. Today i must confess after evaluating Kite for days. Its the best platform for trading with the best indicators. My view on intraday trading changed in the last few days after using Kite for just 3-4 days. The volume bars in green and red makes life easy for trading in Kite . See if you can do that in Pi. I discarded Psar’s and supertrend to add Rainbow Ma ,Alligator & ATR Trailing stop in Kite. Keep up the good work and i hope you add chart compare to Kite. 🙂 and guess what, supertrend will be available on Kite from monday. I am completely satisfied with Kite , It has some amazing Indicators and Kite is powerful and incomparable with other Indian Trading platforms.I gave up trading on HDFC & Edelweiss the day you introduced Kite. Kite has given me the power & confidence to scale up my intraday trading. There are better indicators on Kite than supertrend & psars. I hope you would still consider adding Raff regression channel live on the chart to KITE since you had limitations on Pi ,and my transition to Kite would be complete. Today I could not login with Kite or PI. Both are reporting an error “login Id or password is invalid”. Where as I could login at https://trade.zerodha.com/. I am interested to trade using PI, as I could find some trade opportunities using charts. Because of this I could not trade today so far. I expect it will get resolved soon. We’ve enabled your account on Pi and Kite so you can login and trade now. Thank You for enabling Pi. Is Kite also a premium service? I read elsewhere that Kite is enabled to all clients and the sending of requests is not necessary. Thank You the Team Zerodha. For your kind information, I am not new to login of any of them. I used same passwords for all the above in the morning. Since I got a doubt I got the passwords reset using “forgot password” in the morning and again tried with the new set of passwords. As I could not login in the Kite or Pi and both are reporting an error “login Id or password is invalid”, I wrote in the morning here and I got reply few minutes back that “We’ve enabled your account on Pi and Kite so you can login and trade now.” from Hanan. So my recent is regarding Kite only. Hanan replied Kite is enabled. If it is open to all why it is disabled for me. I could have squared off my Bank Nifty Long position has it been worked in the morning. Is span calculator available on kite. If yes please let me know how to access. Kite is very good and simple. Sorry to ask this question here. a) Can i buy Reliance Nov futures today and sell today intraday .Do i apply MIS here? b) Can i Buy Reliance Nov Futures today and sell tomorrow ? Does T+0 apply orT+2 need to take delivery apply before selling.Do i apply CNC OR MIS here? Pl guide me since i understand STT tax is lower in Futures.I know i have to buy lots . 2) Yes, you can buy today and sell tomorrow. There’s no concept of delivery for Futures trading since its just a contract not an asset. You’ll have to use the product code NRML. CNC is for Equities. Live chart doesnt work in kite. After opening a chart during market hours, live price doesnt reflect on the chart and also the latest candlestick doesnt get updated after every tick. Please resolve it as soon as possible. Kite does update the chart live. Are you facing this issue daily or on specific days? supertrend is now available in kite and its awesome, are u planing to add supertrend in pi soon. When can we get more historical data , custom time frame and bracket orders in Kite? Anil, on Kite there is almost 1 year of intraday data, more than even what data vendors out there who charge money offer. End of day data, we will add more soon. Keep dragging the daily chart to the left, to see more. CO/BO is something that we are currently working on. When the share button is clicked in kite, to where the chart is shared? It generates a URL with a snapshot of the Kite chart which you can share with anyone. Typo error.. KITE is awesome.. Simple, fast and sleek.. Qudos for the team.. Even a newbie like me can trade without any video tutorial..my only concern till date is suppose I buy some Equity with SLM and the order is completed.. Now the price is going in favourable direction and crossed my target.. Now I like to place my stop loss higher but I can not modify the completed order.. So how to put new SL trigger? Also can it be combined with a sell limit order?? Gaurav, once you are in a position the old order is already executed, so you just place a new SL-M order to put a stop-loss order. So the first order is basically called entry order using a trigger, second what is being placed is the actual stoploss order. Yes, you can place a SLM order and also a fresh sell limit order higher than the current price. But you need to remember to cancel one, when other gets executed. What will happen if other order not cancelled ? Little longer, we had some issues with the BO integration on the web. You can create session of PI (from KITE) while raiseing BO order in Kite, so that BO order raise in PI and close the PI session after creating BO order and come to back Kite. you can do same while exit BO order. please add buy,sell,depth and chart tab beside each script in holding window under kite platform,so if we want to add more position or analyse the trend we can do so from holdings window because if we want to do it now we have to shift in marketwatch, it makes marketwatch unnecessarily to long having same script in marketwatch and holdings. That is a nice suggestion, speaking to our tech team. Hi, any update on BO feature on kite ? We are following BO/CO order in KITE and waiting it from 2 months. now one week gone, hopefully we will receive next week update on this. We are in a hurry to have this up as well, have hit some roadblocks. Hopefully soon. Hopefully, this week we will receive update on this. We will inform everyone as soon as it is up Vijay. When Nitin, we are waiting it, as we are unable to access pi during my office time 9 am to 6 pm . you can prioritise high for this feature and do as soon as possible. Hope this weekend we will receive update from you. In kite Cover Order facility will get enabled in near term? is there any timeline for the same as i was told by end 2nd week of December. Kushal, it involves getting approvals from the Exchange. Since the Exchange is involved, its a little difficult to give you a deadline. My Client ID is RS8196. I am not able to login to my Trading a/c since evening after my account was linked today with my ICICI demat a/c. I have tried password reset option but that too does not work. My name is also incorrectly updated as “SANDEEP PURI PURI” instead of “SANDEEP PURI” in backoffice. I have already mailed at [email protected] with ticket ID #319840. But, as the issue is quite urgent that’s why posting here for faster resolution. Necessary changes have been made. Your passwords have been reset. Ticket has been closed. 1. Waiting for BSE scrips to be enabled on KITE for a long time. When will it happen? 2. The order Book and Dashboard is not getting refreshed properly. Can you provide one refresh button. BSE couple of weeks more atleast. About orderbook, having this checked. Waiting for Android Kite….when can we expect the GO LIVE for it…..??? We’re looking at a beta release sometime early Jan.
One of the annoying thing about NSE NOW mobile is that it logs off automatically every 15 minutes…I would like this limitation taken care in Kite Android mobile. Let the session be active even while idle or running background. auto log off can happen only at the end of trading day. Hope the team can accommodate this feature in larger interest. Yep, Kite android will keep you logged in for the entire day. I may be missing a thing here but I cannot add any stocks listed on BSE only and not NIFTY. For e.g. when I search for Kellton Tech(listed on BSE sensex), there is no search result at all so I cannot add it to the watchlist and hence cannot buy the stock. Can you help me out? Kite platform is so good.. Im waiting for the BSE scrips also in Kite. Please provide SENSEX and NIFTY 50 status on Kite instead of checking the market status in other websites. I’m trying to get the nifty index on kite but for some reason it is not showing up in the search, only the nifty futures are. Just type Index and you’ll be able to see Nifty 50. Pratik, sensex was never there. We are working on adding it. I am very much impressed on wish to grow with you. Here are few feedbacks for improvement in Kite, which works well in all places and most people likes it. The drawback on Pi software is it uses random ports which are not usually open in offices. Please make market watch in full screen to see other columns as well. Also after placing an order I need to refresh the page to see the pending order. Sometimes the page hangs to get the data from server and timeouts. I have transferred 5000 to my trading account..Next day i could see the balance in my account is Total account value (4989.69) whereas free cash is 9989.79..What does that mean..cal i buy for 9989.79 rs?? I tried first time adding 250 to my account. Then i tried to buy SBIN but the order got cancelled at the end of the day. After that my account shows 489.69 as Free cash and 239.69 as total account value. why can we order only with 239.69. Where is the rest of the 10.31? If you used the payment gateway to transfer funds Rs 11 (irrespective of how much you transfer) would have been charged for using it. This is charged by the payment gateway service provider. What other methods can we use to transfer funds? And why the free cash is 489.39? Following security bought Last month (fund deducted including STT and brokerage), but not credited to my account:- this happening continues when i am gaining substantial amount with buying ??? We’ll get someone to call you and help you with this. Indicators like MACD, RSI should be added below the chart and shouldn’t decrease the height of chart. Many platforms lack this feature and I would love to see this implemented in Kite. These studies are added below the chart itself. hi, it will be great if you add buy and sell button on charts in kite like pi. When will be Kite Mobile App would be launched? Venkatesh, don’t have a date like I had earlier mentioned. But I guess you know that it is really important for us as a business to have it out, and we are doing everything possible. Nice to use Kite. Just one suggestion, please provide navigation (previous and next button) for the chart (go to previous/next chart in the selected market watch list). i have mac book pro. please tell me as to how to install Pi software on to my desktop. Pi isn’t compatible with Mac OS. You’ve to install Virtual box and install Pi within it. This is Vinay, I am facing issue with Kite chart since yesterday 6:30 pm. I informed zerodha support regarding this. I just wanted to inform you for quicker resolution. The issue is, once the chart loads (Crude dec fut) in 5 min, the subsequent candles are not forming in every 5 min. we have to refresh it to get new candles. this impacts all technical indicator calculation. could you please get this checked. Vinay, this has got to do with browser cache which is not letting the candle update. We are looking into it, until then login to kite using an incognito window. On chrome shortcut key is Ctrl+Shift+N and in firefox Ctrl +SHift+P. It will work fine. Not able to find BSE Stocks in Kite Search. Is there any way to add them to market watch as some stocks are listed only in BSE. Please help on this. Thanks in advance. Hari, BSE is still not enabled on Kite. You will need to use trade.zerodha.com for now to trade on BSE. In the process of getting approvals. How to change answers for2-Step Security Questions? I have one suggestion, while placing order can you allow increasing or decreasing the price using up and down arrow keys, as in ZT. Pressing up and down arrow keys does increase/decrease the price, check out! Thanks for wonderful web based application – KITE. I have a query on NFO – i am not able to see all the strike price (available in NSEINDIA) CE and PE. only few will be listed (please refer the attached jpeg). Can you please arrange to modify the software to list all the strike price for CE and PE for the current month?. Anandan, the search box is google like. So search for Nifty ce dec, u will see all strikes. U can also search for Nifty ce dec 7500 if u want to see that particular strike. The extension of market watch was nice and much needed. It now gives the flexibility to track multiple scripts. To take stock and lookup trading opportunities, the open / high / low prices is much required. The market watch half could possibly expand into the dashboard half and collapse when not req. Presently the net change is shown in %, its much more easier to scan if the change is shown in points vis-a-vis %. Is it possible to provide straddle / strangle charts. Would really make taking straddle / strangle trades simpler if charts of the same are available vis-a-vis doing manual calculations. BSE isn’t available for trading on Kite yet. We will let you know once its out. I cant add more than 20 scrips in my watchlist. could you please guide me how to add more than 20 scrips in Kites watchlist. Sathi, we have given total of 5 watchlist, see at the bottom of the watchlist, you can see numbers 1 to 5. Max per watchlist is 20. Am I the only one or is there anybody else who is finding the performance of Kite deteriorating faster than Crude prices of late? I have experienced the following mishap TWICE in the last 5 days. 5. A few seconds later, I got 1 notification for 125.4 order execution. 6. A min later, I got a 1 notification (catching me out of blue) for another order execution at 125.3! Dear Nithin, I have been very happy with Zerodha since I took up a membership back in January, but these kind of errors are happening more often now.. Can you please instruct the technical team to looking into these load-related issues pls? I spoke to the customer care but sadly their response was neither helpful nor assuring. Asking me to ‘clear cookies’ for every problem I get from Kite isn’t exactly insightful ! Do i need to have demat account mapped to my trading account, just to add stocks/index to my Kite market watch? I couldn’t find that option. Please let me know. Not yet, we will have it very soon. Ashish, for now it is not possible. But maybe in the future. I have been a Zerodha User ( 3 family accounts) for last 3 years now. I am very sad and hurt to inform that Zerodha’s customer care service quality has fallen to unacceptable levels. People from concerned team were very rude. Please look into this or else you will leave me with no option other than to cancel my accounts. (This has happened second time in last 6 months). Surprised Rahul, do you remember whom you spoke to? Could you tell me the meaning of these figures on the positions page? The top and bottom both show different figures. Also, I don’t have any pending transactions or options. But that figure of “150” is getting highlighted in red as you can see. I am unable to bring up the “Exit Position” and “Convert Position” page. It doesn’t show when I hover the mouse over it. I have attached the screenshot taken long after market closed today. Arun, Days history shows up what you have done during the day. Looking at the image, I guess you had 150 7800 CE from yesterday, you sold it today. So main position has become 0, days history shows the 150 you sold. Yes day’s history is confusing, we will have it removed in the next release. First of all, Thank you so so much to give us this kite platform. It has certainly changed my trading style and has become my lifeline. But there is always room for improvement. So here is what I would recommend or request. Please for the love of God include the Bracket order and Cover order in Kite. And Please increase the Market watch-list tabs, currently only 5 tabs available, please make it to 10 tabs. I hope you consider my requests. Hi SJF, BO/CO will come soon. More than 5 tabs, hmm… dont think it will be possible for now. When Valid till Cancel order facility will be enabled? It is so unproductive punching the same orders day after day especially when liquidity is so low? Will take a little longer. I have recently opened trading and denat account in Zerodha. I was not able to search BSE stocks on kite platform. So is kite restricted to transactions only on NSE stcoks? Lohit, BSE will be available on Kite in a few days. Until then you can use trade.zerodha.com for this. I am not able to list the scripts in kite. I tried in chrome and firebox but I am not able to list watchlist items. could please tell me reason and solution for this? Which scrips? You just have to start searching by the name of the scrip in the search box. If you are having issues, send an email to [email protected], someone will call back and check. “Forgot Password” option on Kite is terrible. I had a trading account working fine following which I had opened a Demat a/c (opened last week). After this my password has stopped working. I have tried using “Forgot Password” option on Kite multiple times without any success & the experience has left me totally frustrated. Either I am using it incorrectly or there is something seriously wrong! How can we do live Market Analysis with Kite app. if i want to search the NSE or BSE market for last 1M with certain volume/price, where can i set such custom filters to get live reports. Basic Order Type should always be “fixed”. If last time I have put a SLM order next KITE remembers that and when hit sell it goes to SLM order. This is dangerous . trader is alert about price. So he misses this detail a lot. I have missed this a lot of time and when trying to set the target order I mistakenly forgot last SLM order type and whetever target price I put it for executed! 1) Give user choice of fixing default order type. 2) or best way Create extra buttons for SL orders say SLB and SLS for putting buying and sellign stoploss. Current setting of KITE remembering last order is very very BAD. Vishy, this feature of remembering last order was done on request by many traders. Let me see what can be done. Unbelievable that traders requested this! Once you place SL order how next order a trader wants to be a SL only??? If I get entry at my price level then I place SL order FIRST and Target exit order. user settings… as each trader may choose things as per his style. 2) Few month back these indian trading league guys have already included Bracket order in their platform. I wish same BO and CO included in KITE As soon as possible for all segments. 3a) Chart Scrip Autorotate feature such that if turned on chart shifts between scrips automatically as per user set time interval. 4) Also I wish sound alert whenever security price passes through user set price level. say >= or <= greater than or less etc. and KITE gives a beep! sound, or makes the scrip in scrip list flash in colors such that it catches viewers eye. 1. Yep, we will give a settings option on Kite soon. 2. Yep we will have it on kite soon. 3a/b. We are working on seeing what can be done. 4. this will take some time. Just type sunpharma 800 ce and you’ll be able to find the contract. Attached screenshot. (ii) What is the calculation for the “Pivot Point” levels provided under studies. (iii) For Renko, can a provision be provided for setting the brick size in %. As one has to keep changing the brick size for diff scripts, as there is no direct method / dialogue box provided if a new chart is opened in the same tab or even a fresh chart (as Kite uses the last used setting). Am attaching a screen shot where the range as per dialogue box is 0.05 – 0. Pl check. I would like to share this . Using Kite on Microsoft Edge consumes less resources of your pc as compared to using Kite on Firefox. I always was annoyed when Kite slowed down and finally I checked task manager and compared both the browsers. Try this out and correct me if I am wrong . I need to compare Firefox & Chrome with Kite. I rechecked and /Google chrome browser is also better than Firefox browser in terms of resources , Trying using Kite on Microsoft Edge browser or Google Chrome.It seems Firefox not only consumes more resources on your Computer it also slows down kite maybe for that reason. This is my personal experience . Do try it out . Kite is a web app and renders quiet well on a mobile phone. Can u give a definite timeline on BO and CO in kite (I read here in some thread it Ll be incorporated by end of Dec) doesn’t seem that happening soon. Though I love the look n feel of kite and its ease of use But BO introduction ll be cherry on cake, since it is not possible for me many others to carry personal device to office. Mohit, some technical roadblocks. Can’t give you a timeline, but we are working on making it happen. Hope BO ‘ll be new year gift from zerodha ;). without BO kite is not that attractive. Yep, BO will come shortly on Kite. Kite is Slick,Smooth n Superb !! Zerodha Rocks and expecting more in 2016. 1) Any plans to introduce GTC orders ? It will be easy that we can place order just once. 2) Whether SL/Target/TSL can be scripted in Pi Tradescript ? 3) Fibonacci Extensions and editing fib levels in Pi, can we expect soon ? 1. Yep, GTC on kite is being worked on. 2. Can’t really be scripted, but you can use the Bracket order for this. 3. Fib extension and editing on Pi will take a little longer. We’re working on adding these features on Kite in the coming days. We’ll keep you posted. In the Pi or Kite software,s uppose if a buy order is placed with 5 lots of Bank Nifty @17000/-. 2 lots gets executed and 3 lots don’t get executed due to market movement and are pending.If rate modify is done to the balance lots to execute the order,would an additional brokerage of Rs.20+Rs.20 be charged or would it be considered as part of the initial order and brokerage of Rs.20/- be charged. On modification of the price for the pending order, the order number doesn’t change and hence you only get charged Rs.20 as brokerage on execution. its 2016. when will you release the dedicated android app with state of the art tech? It is been long due that we need a dedicated mobile app…Please make it soon happen as the we can not just relay on website wen almost every brokerage house coming up with innovative mobile app. Btw just crossed over Zerodha new office today. It is pleasure to watch the beautiful workplace . do you have a stop loss feature in kite ? Yes. Check out the order window, it has both SL (limit) and SL-M option. Sir, in this case suppose order was executed at 100 and CMP is 103 can we put SL/SLM at 99 or it should be within 100-103? If yes then which product type one have to select . pls come with solution where one need not to select product type . Brijesh, yes we support BTST on all stocks. Use the product type CNC for all equity delivery trades. BTST has some risks, make sure to read this post. Kite is fabulous and “kannada” version is icing on the cake, I am loving it. Both are in the pipeline, we’ll let you know once they’re through. IPO’s are a little tricky because regulations still require some paperwork to be done. We’re waiting for the entire process to go online. I am a fan of kite and using it and enjoying it. But when i place a limit order so it will not executed some time whereas the limit price stay 10 to 20 seconds and i have the same condition in pi so it get executed. So in this condition we have to executed it on market order. So Can you do something about it because it is working on mobile and 2G also so it good for everyone. I hope in future to kite have bracket order or cover order also. Bhanu when you place a limit order, it will get filled only if your price reaches and you are on top of the queue of everyone who has placed an order at that price. It has nothing to do with Pi or Kite. I have observed that some times intraday O L H C are not plotted in kite exactly. here is an example of the same. today for crude the low 2267 but its not showing in chart. by looking at chart we feel the script is trading at low point of day which is 2290. I feel this is happening because the ticks to plot charts are read from the market watch LTP. if L or H does not come in LTP its not shown in chart. Is there a chance to rectify this. I don’t have BSE in my exchange list on home page trade.zerodha.com, List contains (nfo,nse,cds). I am on zerodha > 6 month. Can you please guide me what is the problem I Cannot add BSE only stocks in my watchlist. Hi! Will Zerodha give us access to Singapore and other foreign exchanges to trade from India, for Indian residents? We don’t have this in our immediate scheme of things. There are more details here: http://tradingqna.com/784/how-can-an-indian-investor-invest-in-foreign-stocks on how it can be done. I am contemplating about opening an account with you as I have been looking for a good browser based charting + trading platform. After having gone through the discussion in this forum, looks like Kite suits my requirement. I intend to open only a trading account (I am already having a couple of demats with other conventional brokers) with you. Will you provide PI and KIte access for trading only accounts? Yes, you get Pi/Kite if you open only trading. During the weekends (Saturday) probably you have a demo session. The demo session probably lasts for a couple of hours. But the trading data for the demo session is not removed till Monday morning. It is during weekends that one can review multiple stocks and prepare possible trading plan for the next week. But that is not possible, because the charts are all screwed up. Why cant the demo data be wiped clean immediately on completion of the session. Zerodha needs to tighten its operating SOP’s. The demo session can be limited to a few thinly traded scripts or even a few hypothetical mirror scripts can be created which can be used. Why open up the full database. The present structure of the whole exercise is very very SUBOPTIMAL. Ashish, every month once there is mock trading conducted by the exchange. It is done on all scrips, and it is for everyone to test their systems. We clean all the data up by saturday evening. Are you seeing charts screwed up right now? Yes saw this, we will try to have this sorted by the next mock. Please add option to apply black theme to dashboard, Marketwatch too. I have couple of requests on Kite…one regarding the webpage css and other regarding chart data. 1. The Kite Webpage: The issue is when I click on the Buy (B) or Sell(S) button, the Buy/Sell window that shows up stays at the bottom center of the screen and always overlaps the quotes/market depth details on the left hand side (Screenshot attached). It could be because of my screen resolution – 1440 x 900 (Macbook Air). But its annoying to say the least, as I have to reorder my list of scrips in the marketwatch in order to be able to see the quotes for the bottom scripts in my market watch list. Is it possible to make it floating/movable or shift its location to bottom right corner? 2. Chart Data: I have noticed that daily/weekly chart data for last 5 years is available only for some scrips e.g. AXISBANK whereas only 6 months data is available for some like SUNPHARMA. In such cases, I have to scout for other sources outside of Kite to find out the support and resistance levels for that scrip. Is is possible to make 5 years data available for at least the 50 NIFTY Stocks and the 166 F&O stocks? 1. Having this checked. Until then u can use shortcut key “esc” to make that window disappear. 2. Yes, EOD data for a lot more stocks will be added on Kite soon. Excuse me for not not communicating properly but the issue is not that I am not able to close the window. I am able to close the window when I click the “X” button. The issue is, I like to keep the Buy/Sell window open for quick ordering and it always overlaps lot of the bottom stocks in my markerwatch list. That is reason I was wondering if we could move the Buy/Sell window little the right so that it stays clear of the Marketwatch list. Ah k, let me speak to our team. Not yet, Kite android should be out soon. Until then you can try Kite on your mobile browser. Hey Nithin, just wanted to know why track all open orders button is disappeared in kite? Had some tech issue, we will probably bring it back in the future. Will kite mobile app have spread order? & when will it launch.? Weird, can you send an email to [email protected] with your client ID. 1. Have same login id and login password for Q, Kite and Pi. Transaction Pwd and Sec Questions can remain as it is. 2. Facility for instant credit in ledger if a client transfer funds using IMPS. 1. Login id is same for all trading and Q passwords. Pwd currently is different for Kite/Pi which is trading, and separate for Q which is reporting. Btw you can access Q from within Kite and Pi without a pwd. a) When you popout the chart there is no buy sell box in the popout chart. Would you be incorporating this in the next update of Kite.This would help in easy trade since its not possible to change windows to buy sell and check the popout chart at the same time. b) Correct me if i am wrong , Kite main page does not have the settings feature to change the background color of the chart – black or white.? Please provide that buy sell button in chart in mobile KITE also, which can take my default options for ordering, with a confirmation message to avoid accidental tap on those buttons. Note: It is taking too much time for me, if I am seeing the chart, to go to the market watch, pick the scrip, tap the buy/sell button there and then put an order. Thanks in advance. Thanks for your great effort. In the last image (Multiple Marketwatch) picture, I notice there is some overlay on chart representing stop loss limit and buy/sell signal. How do I get this turned on in kite? The last chart has supertrend and volume profile indicators. Click on the studies option on the chart. Kite on android please… When can we expect? Great work on Kite, super like it. Need CO/BO in Kite. is jumble of figures corresponding to the the indicators drawn on the chart.It is difficult to find the value of the equity/index among the jumble of figures. It would be easy,if a line is drawn horizontally which will move along with the equity/index figure. Or,alternately there should be an option to remove the figures which are not needed. Hope it can be done,to reduce the strain on the client’s eyesight. First of all, Thanks for providing KITE platform. It take lot of efforts to build such light weight and user friendly interface. Being from IT , I can understand the efforts your team might be putting to incorporate valuable suggestions given by Zerodha users. I also like your prompt response to positive or negative feedback given by users. There are really good Zerodha users who give constructive suggestions and which helps all. This is really professional behavior of Zerodha uses and Zerodha team. 1) BSE listed companies to be able to trade in Kite because its bit tedious to again go in App or Zerodha web client. 2) KITE android app. Be it BITA version which will have scope of improvement in future release. This will strengthen KITE platform as a complete package. Could you please share your realistic plan on these release. Its file if you tell in weeks or months but it will not keep us guessing. Thanks Samir, it has been getting delayed, but we are hoping both BSE and android beta in 4 weeks. I want to know about mobile app trading platform…apart from NSE Now or Zerodha. do you have any other like PI or Kite.?? Kite mobile will be launched soon. Please consider adding few more columns to your “holdings” section against each entity, for eg: Total amount invested in each stock, % profit or loss in each stock etc. is it possible to avoid Series /Settele colume in our website. its killing time to find stock in which series. as i fond same column is not available in other broker. so we can save time. Can you send me a screenshot of what you are saying to [email protected]. Not able to figure out what you are saying. I like Kite very smooth and fast.i have only one question. Did we able to set scanner and Option like Backtest is availble in kite. Not in the immediate term. Kite is a light version, if you want features like backtesting, scanner etc. use Pi, our desktop application. Do you guys have any plan to introduce Systematic Equity Plan similar to SIP of mutual funds at zero dha ? Or IPO/Mutual Fund investment via zero dha platform? Yes, MF purchase can be made through SIP route. ya knaw the best thing which happened to the internet?? Few things which i want to share. Kite doe not have BSE trade feature yet. If i purchased intraday stock using PI tool and i want to place order or sale if Kite does not have BSE trade feature, you guys charging 20rs for call and trade. ?? Call and trade shold be free if you guys does not have bse trade feature in kite.